Everyone knows the one about rugby players and oddly shaped balls. As Jo Laidlaw discovers, there’s some Border confectionery equally deserving of its place in the rugby lexicon. Hawick’s late, great Bill McLaren was famously never without a poke of the traditional sweeties named after his home town. He used them to start conversations, elicit information and garner gossip that would then be added to his ‘big sheets’ – the detailed information he used to support his rugby commentary. Despite McLaren’s deserved reputation for impartiality, however, the members of the England team were apparently never invited to partake of his sweeties. Now produced by Greenock-based Golden Casket, legend has it that Hawick Balls were ﬁrst made in the town in the 1850s by one Jessie McVittie. She used to ‘pull’ her boiled sugar mix by hanging it over a nail and allowing gravity to stretch it out. Although the exact recipe remains secret, today the bools are made in open copper pans – which caramelise the sugar – with oil of peppermint providing a minty hint. The resulting sweet looks a bit like a pickled onion (or, according to some, a sheep’s testicle). The ﬂavour is buttery and actually quite grown-up, with a hard crunch setting them apart from other traditional sweeties from Borders towns such as Jethart Snails and Berwick Cockles, which have a rock-like texture. 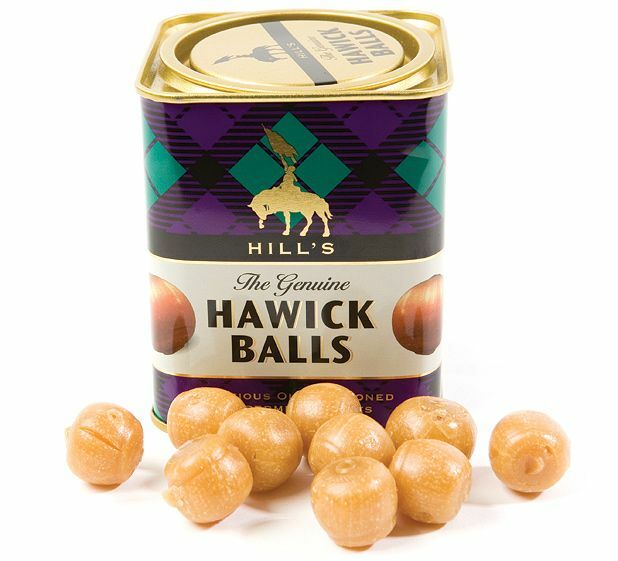 Scots are famous for their sweet tooth and, although Hawick Balls have moved away somewhat from their original place and method of production, they still feel like that rare beast – a local, traditional product that’s both accessible and fun.